Does SCP really mean Snap, Crackle & Pop? How should Wavetool be connected? Q: Do I need the Client plug-in to be able to view/ control Wavetool from the desktop / iOS Remote? I want to do a setup with A2 using Wavetool and iPad remote plus FOH A1 wants to monitor what is going on as well. A: No plugin needed. You`ll need a Client plug-in only when you want to have a multi-user setup with independent audio mixes, audio outputs and channel layout on Remotes. Q: Price of the desktop Remote? Q: Do I need the Chat plug-in to enable chat between Wavetool and remotes? Q: Will there be a Wavetool version for Windows or Android devices? Q: How long will the Trial Mode work? A: The Trial mode will work for 30 minutes then the audio will be muted. Q: I can`t connect to my wireless receiver with Wavetool? Q: I can see RF level of the receiver on Wavetool but battery status or active antenna info is missing? A: Name your wireless receiver channels with unique names either from the receiver manufaturers own setup program or directly from the receiver front panel to let Wavetool detect the receiver channels correctly. Q: Wavetool won`t start up? A:OSX needs to be 10.10.5 or later and the computer needs to detect at least one audio device. Open Audio & Midi Setup of your computer to make sure you have i/o device installed. Mac Mini 2014 does not have built in i/o so you need to install a virtual sound card or a hardware sound card. Q: My iOS iPad is looking really strange after connecting to Wavetool? Q: Audio in Wavetool sounds strange / distorted? A: First make sure that your Wavetool Audio Buffer Length is long enough for your audio device. Default is 128 samples which works well with most of the audio devices. If making buffer size greater does not help, please record your audio with software like Audacity, Reaper or Garage Band and verify that your audio is clean in the recording. If this is not the case, you probably have an issue with your audio chain / network. Q: I can ́t find a link for plug-in purchase from Wavetool web shop? A: All the plug-ins can be purchased directly from Wavetool V2, under Wavetool menu item. This is the main window of Wavetool. Please note! You can control Wavetool with the desktop and iOS remote softwares without buying the Clients plugin. This is the Wavetool toolbar. Select tool: Choose this icon and then choose the channel you want to solo listen to. Hint: You can also use the arrow keys fore faster navigation. Zoom tool: Choose this icon and select a channel for Instant Replay and detail window. Instant Replay, sololisten and detail window. Switch between panel A or B here. You can edit different channels to panels in channel I/O. Solo Clear: Choose this icon to deselect all soloed channels. Clear all soloed channels, including hard solos, by pressing Solo Clear for 1,5 seconds. HINT: SHIFT + Left Click will reset single channel alert. Chat: Opens Chat window. For more info check Chat section. Groups 1-8: Groups that have channels assigned to them are displayed here. For more info check Groups & Snapshots section. This is a channel. The input number is indicated top left. Channel name is located bottom center. The green trace shows the last 10 seconds of sound level. Audio levels below -48 dBFS are not shown. To listen to a channel, click/tap on it. Active channels are surrounded by a green frame. You can change the single/mixed listening mode in preferences. Certain channels must be kept on at all times and good examples are comms or band talkback. Simply press on the channel until the frame turns white (1.5 seconds). Now the channel is locked in “Hard Solo” Mode. Remove the lock by pressing the channel again. In our shows there are usually many channels and it is hard to keep track of them all. That’s why we created groups. Groups use a coloured background, instead of the normal grey, to highlight each channel name. You can listen to all the channels in a group by pressing the group button. And if you don't know all the actors you can add a picture. For more info check the Players section. HINT: Select multiple channels to make quick adjustments. HINT: Use ENTER and TAB to move between Names, Gain and Pan for faster editing. HINT: Drag and drop channels and columns to edit order. Name: Edit names by double clicking on the name. Input ch: Assign hardware inputs to channels. Wireless device: Click a row to show a list of found receivers. Link an RF receiver to the input channel. This will display RF and battery data in the main window. Disable SCP: SCP is designed for live microphones. You might have other input sources. Disable SCP to avoid too many false alerts. Disable RF Warnings: If your transmitters move out of reach a lot you might not want to be alerted every time. Set Gain On Selected Channels: Lets you gain multiple channels at once. (Channel max gain is now +28dB). HINT: Write "--" + three characters after the channel name. And the channel strip number will be replaced by these three characters. You need to type in the transmitter's ip address and select type of transmitter. Do this by opening the "Wireless IP" window under Edit (⌘W). If the transmitter is connected correctly the Ping will show OK. You can save your ip setup and open it at a later time. Or import the info from WWB (Shure Wireless Workbench ) Once the setup is done the "Ch I/O" page will show all detected receivers by name in the drop-down menu. HINT: The receiver channel names need to be different for every channel that you want to use. HINT: With Sony DWR Receivers, you`ll need to have the transmitters on when you pair the receivers with Wavetool. HINT: For Wisycom it is not possible to run the Wisycom Manager simultaneously with Wavetool due to a limitation in the receiver. - The red trace shows the last 10 seconds of the combined antenna input. - Next to the input channel number A/B letters show the active antenna input on the receiver. - A battery indicator is located on the top right. There are two types of alerts available when connected to a wireless receiver. - The “LOW RF” alert will turn on when the incoming RF signal drops to zero. This alert can be turned off, on a channel-by-channel basis in the "CH I/O" window. The "LOW RF" alert will recover when the RF level comes back. You can change this behaviour and RF alert threshold in the Preferences (Cmd+P) window. Quality meter can be low although RF level is high. Battery status shown in h/min. Works when the transmitter is used with the manufacturers own battery pack and the receiver shows this value. Features specific to: Audio Limited A10 RACK. The transmitter has a memory card slot and it allows the user to record directly to the memory card. Wavetool is able to show if the recording is on and displayes it on each channel strip in red. Get instant access to your audio history! With Instant Replay you can go back in time and listen to 5 min of audio history! SCP will tell you when it thinks you might have a broken mic cable or other unwanted signal. Instant Replay lets you go back in time and listen to it! When selecting a channel with the Zoom tool. The Instant Replay window shows you a 5min audio history of the channel. Here you can with a mouseclick go back in time and listen to the channel audio history. And with ⌘M make a blue marker in the timeline. Upper left corner in red shows you where in history you are listening! The + Button shows or hides the Channel Detail window. The slider works as an zoom tool, that lets you zoom in on a specific area. Export audio: Lets you export an 5min audiofile for later examination! Stop Instant Replay: Stops the playback of the audio. Timeline to zero: Resets the timeline to zero. The red solid vertical line is the playhead. Red dotted vertical line is a SCP marking. When selecting a channel with the Zoom tool. The Channel detail window with Instant Replay lets you view the labels of the channel and comments, like mic position or default beltpack gain. Press the +/- button to show or hide the Channel Detail window. Under the Preferences / General menu you can adjust the following settings. SCP sensitivity (Default: Hight). Lower the setting if you are getting too much errors. SCP is looking for unnatural sounds and you might need to change this setting depending on type of microphone or sound source. High gives more alerts, low gives less. Low frequency detector sensitivity (Default: High). SCP looks for very low frequencies that are produced when a cable is broken. If you are working on a loud stage or microphones are near bass cabinets you will need to lower the sensitivity. Disable all warnings. Maybe you are preparing the gig and don't want multiple alerts going off. Recover from RF warnings. If your artist is running back and forth to a dressing room with no RF coverage then the Low RF alert will be reset once the transmitter is within range. RF alert threshold: Set the threshold for when you want to show the Low RF Warning. Battery alert threshold: Set the threshold for when you want to show the Low Battery Warning. No signal threshold: dBFS from -180 to -60 (0 = off) Set the threshold for when you want to show the No signal Warning. Log warnings to: Choose a place to save your log textfile. Channel metering & SCP mode: Pre Gain / Post Gain setting. Post gain should be used when getting mic level signals straight from the receiver to Wavetool, as one needs to gain +10 to +24dB every channel. Single solo mode. Familiar from most mixing consoles. When activated you can only listen to one channel at a time. When not activated the channels will work in "mixed solo. Maintain solo selection after snapshot change. Search for Sennheiser 3532 devices when WT is launched. Search for Audio Limited A10 RACK devices when WT is launched. Attention! A10-RACK and EM3532 can not be used at the same time. Under the Preferences / Display menu you can adjust the following settings. Player image opacity: Set the opacity of your pictures on the channels. Flip channel strip lables: Puts the name label at the top of every channel. Reset to default: Resets to the Wavetool settings. Under the Preferences / Chat menu you can adjust the following settings. Keep chat window always on top: Keeps the chat window on top of all programs. Flash screen when chat message is recived: A red frame around the main window will blink on incoming chat message. Listen to chat OSC message on port 53005: Chat accepts OSC messages. As an example, in QLab it`s possible to do a network cue, which sends a message to Wavetool Chat member(s). /wtchatflash/QLab/Foh "SHOW IS ABOUT TO BEGIN!" Chat Macros: Edit the messages for the Macros 1-7 and assign a MIDI message as a trigger. Message settings: Choose which messages you like to show up in the chat window. In Edit Mode (⌘E) you can Drag and Drop the channels as you like to have them in the Wavetool Main window. In Edit Mode you can also edit single channel settings in the popup window by clicking on the channel. Wavetool can stream audio to your iOS device. On a bad WiFi connection, you will notice the buffer size fluctuating widely. If the buffer runs out, the connection will be reset and the buffer will need to refill itself before audio playback can resume. Start the stream by tapping on the “Start stream” button in iOS. Tap on Stream Buffer to edit the buffer. The buffer size can be adjusted from 50 to 3000 milliseconds. Try with a small buffer size first and increase it if you encounter problems. SCP, short for Snap, Crackle and Pop is our own algorithm for detecting problems in an audio signal. SCP is designed for use in live theatre and other applications with live microphones. It has been tested with dpa miniature capsules connected to various wireless systems and dpa 4099 instrument microphones. Set the SCP alert level to your liking under Preferences. High sensitivity will give you more alarms while low sensitivity will be more robust. SCP will tell you when it thinks you might have a broken mic cable or other unwanted signal. Access the Chat window by pushing the Chat button in the main window. Here you will find seven custom macro messages that you`ll be able to edit in Preferences / Chat. At the bottom of the chat window you`ll find a drop down menu with all the chat members. You can send the message to all the chat members or directly to one member of the chat. A text field where you can write a custom message. And two buttons Send and Flash. Send will send the message to the assigned recipiant. Flash will send the message and page the recipiant with an blinking Chat notifier with the written message. Please note! The Chat plugin works between Wavetool and the remotes. You don't need the Clients plugin for the Chat. On the iOS device, swipe right, and you`ll find the settings page. Here you can set your chat username and text size. Choose to which master/client you want to connect. Choose between PCM or AAC as Streaming mode. Mono or Stereo. Single solo mode on or off. Choose the number of Macros that show up in the chat window. And fIlter the chat messages. On the iOS device, swipe left, and you`ll find chat window. Hint: Press and hold the chat macro button to edit text. To add or edit a Player, go to the Edit menu and Players, or use quick command ⌘A. In Players window you`ll be able to add or edit players for the show. 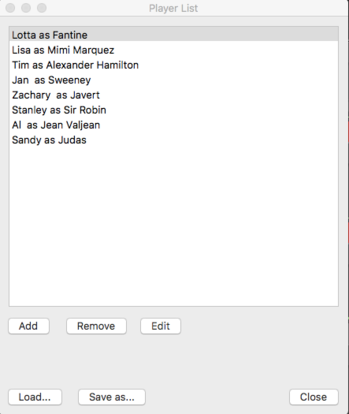 You can add a image, name or role name and write additional notes for the player. You can link the player to the matching audio channel in channel i/o Player drop down menu. The Player image will then be shown on the channel and it`s opacity can be adjusted in Preferences menu. When selecting the channel with zoom tool a zoom window will open up with Player details and with five minutes of Audio and RF history of both antennas. You`ll be able to save/load your cast with several Players. Open Groups & Snapshots from the edit menu or use quick command ⌘G. In this window you`ll be able to name snapshots, name the groups, assign channels to groups, add new snapshots with independent group members and set MIDI parameters per snapshot, for an external snapshot trigger. You`ll be able to move snapshots by using move up or move down keys. Group colors can be changed and all the changes needs to be done EDIT ON. To change snapshot, open up your snapshot list from the edit menu. If you hard solo a group by pressing it 1,5 seconds, it will stay soloed even when changing snapshot. Clear all solos, including hard solos, by pressing Solo Clear for 1,5 seconds. The desktop and iOS remote softwares are free of charge and can be found on our download page. Up to four Remotes with independent audio mixes can be used with the Wavetool master when connected to the same network. The Wavetool master and all the Remotes has it's own independent audio output, from the connected output audio device. To assign a hardware output to a Remote, go to channel I/O window, choose the client tab you want to edit and assign your hardware audio output. Master and client can not share the same output channels. To edit client channel layout, drag & drop channels, enable/disable channels or assign them to Panel A or B. Pan / Gain can be adjusted independently for all clients. Client name can be changed under Client tab and client friendly name. Copy layout from Master: If you have made a layout on the Master and want to copy it to the Clients. HINT: Both Desktop and iOS Remotes can be set to control the Master Wavetool computer. An connected iOS Remote can stream audio to the iOS device. Push the Start Stream button in the iOS app to start the stream. Next to the Start Stream button is the streaming buffer. By pushing the streaming buffer you`ll be able to adjust the lenght of the buffer between 50ms to 3 seconds, depending on your network quality. You can lock and unlock Wavetool from the edit menu or use the quick command ⌘L. Wavetool on mac supports MacOS versions 10.10.5 (Yosemite) and later, also 10.14. (Mojave), but please make sure that your audio interface is supported by 10.14. Total System RAM 4GB minimum, and when using Wavetool Instant Replay, then 8GB is recommended. Screen resolution 1024x768 minimum. Intel Core i5 processor or newer is recommended. Wavetool on iOS supports iOS version 9 and later. We want to save your show. We want you to save your show. Oh, and enable you to open it again at a later time. All settings of your show are saved as WTF. A simple guide for simple audio professionals. Automatic discovery within a local network. No network or port setup needed for the user. Do you live in a larger managed network environment? No problem! Use static ip addresses for your devices. Wavetool traffic can be routed between Vlans. All you need to know is the IP address that your computer uses to connect to the network with access to the iOS device. That address needs to be entered into the Wavetool iOS remote. Wavetool uses TCP and UDP traffic. If the TCP port 57576 and the UDP port 5353 (Bonjour) are blocked, your IT wizards will need to open them. Sennheiser receivers talk on UDP port 53212. Turn off option "Show Wi-Fi status in menu bar"
Go to System Preferences -> Network. Select Wi-Fi on the list. Press the "-" button on the bottom and "Delete the selected service"
Now your computer is operator-safe! DHCP automatic ip addresses are a nice way of getting all you devices to be easily found on the network, but we have noticed that DHCP addressing causes a lot of issues for many sound engineers. We recommend putting static ip addresses on all your gear. We often see people running separate networks for audio (as in Dante or Ravenna) and control (wireless receivers and Wavetool iOs devices). We do it ourselves. As long as you keep you cables marked and color coded you should be fine. Use static addresses (see above) for all networks and leave the Default Gateway empty (see above). It also helps to rename the network card so you can find them easier (press the gear under the network interfaces list to do this). It might be necessary to use inputs from different audio interfaces. Apple uses a function known as aggregate device, which allows the user to create a virtual sound card that uses many physical interfaces. Because this is all Core Audio, Wavetool will happily use aggregate devices. For instructions on creating an Aggregate Device, please check out this neat step-by-step guide from Native Instruments or Apple. HINT: You can change the channel order in an aggregate device by dragging the interfaces from left to right in the setup screen. You can use different input and output devices (e.g. Madi in -> internal Line Out). Wavetool supports 48kHz and 96kHz sampling rates. Wavetool prompts you to choose the interface at startup. Both interfaces need to be in the same sample rate and bit depth before Wavetool can accept them. Please go to OS X Audio/MIDI Setup and ensure that your devices are in the correct sample rate and bit depth. Wavetool has been tested with Dante Virtual Soundcard, Digigrid MGB and RME HDSPe (using thunderbolt PCIe chassis). Our test computers range from various Mac laptops to MacMinis. We are confident that Wavetool will run seamlessly on any up-to-date Mac. Please make sure that at least one i/o device (hardware or virtual) is connected to your computer before launching Wavetool. Monitor up to five receivers linked over one serial port. The driver needed for the Brainboxes / SerialComm USB-Serial adapter won`t work out of the box with MacOS 10.14. If you are planning to use EM3532`s with a computer running MacOS Mojave 10.14. please contact us first at support@wavetool.fi for more instructions. HINT: When choosing audio input to be NONE with Sennheiser EM3532 & EM1046 Wavetool shows the receiver audio level. Wavetool will work 7 days without a license on your computer. This is enough time for you to fall deeply in love with us. To make our platonic relationship official, get your Wavetool licenses in our shop. The Wavetool Lite License limits audio to 16 channels. All other features are exactly the same as in the Pro version, including SCP and RF integration. Please notice that buying Plugins for Wavetool Lite is not possible. This license is for one computer, and can be remotely controlled. The Wavetool Pro License includes 64 channels of monitoring and amazing RF integration.You can expand your standard license with in-app plugin purchases. This license is for one computer, and can remotely be controlled. Please note! It is possible to use Wavetool Pro with the free remote software. You don't need the Clients plugin to control Wavetool Pro. The Wavetool Bundle license includes Wavetool with the Chat, Snapshots and a whooping 128 channels of monitoring! The Wavetool Bundle license includes Wavetool with all available plugins. With the Platinum bundle you can create separate listening busses and layouts for each Remote, catering for different engineers' needs during the show. This is for all you crazy Wavetool lovers out there! Expand your audio to 128 channels! Make dynamic group changes. Control Snapshots by MIDI. Communication between remotes and set up our user configurable macros for instant messages. Please note! You can chat between Wavetool and remotes without the extra Clients plugin. Clients is the greatest plugin of them all! Clients enables you to make different channel setups for each Remote, up to 4 separate audio mixes for different remotes. Bring your audio to one place and have different people listen to different channels. If you are planning on putting 3 Wavetool computers in your show, this Plugin is for you! Used up your trial and not sure yet? A gig coming up this weekend and Wavetool would be the perfect tool? If you rent Wavetool you will get the full package with all plugins included, like in the Platinum Bundle! If your are interested in production-specific licensing options we ask that you please contact us directly. Using traditional USB or networked audio interfaces there are many different options. Here are two system drawings using Dante and MADI as examples to help you get going. Using Dante Virtual Soundcard from Audinate you can get your Dante audio network channels to show up in Wavetool. You can then stream your monitor feed back to the Dante world or simply plug in your headphones in the computer. MADI being the choise of many console makers, it is easy to plug Wavetool in to your MADI stream. Split the MADI signal from your stage rack and plug it in to a MADI interface in your computer. You can then listen to the MADI feed with headphones, external sound card or by building a WiFi network for remote operation and listening with iOS devices. If the iOS device jumps between two WiFi access points it will lose connection for a short period of time. This will reset both the connection and the iOS audio stream. If you encounter problems with your network, here are some things to consider. Currently, iOS devices automatically search for internet connections on a given network. If the network is a local one without access to the the internet, the connection drops and therefore, you should manually specify network use without internet access under iOS settings. Trouble finding your wireless receivers? After you put in the ip address of the receiver Wavetool will look for receivers every 10 seconds so please be patient. Wavetool lists your wireless receivers by name in the drop-down menu under CH I/O, so make sure every channel has a unique name. Format the names as 01_Name to get a nice alphabetically sorted list. Can you ping the receiver? Open Terminal.app (under Machintosh HD/Applications/Utilities) and write in ping [ip address] (example: ping 192.168.1.45). You should see that the receiver is responding. Quit by pressing CTRL+C. If the receiver is not responding you have a problem with the network settings. Check receiver, computer and network switch settings. Are you using multiple network interfaces? Try turning Wi-Fi off and disconnecting all other networks for troubleshooting. Are you using DHCP? Set all the devices to static addresses. If your are using Wisycom receivers please make sure that the Wisycom control software is not running. The receivers can only accept one connection at a time. Sorry. IP addresses and players will be deleted if you don't save them separatly.